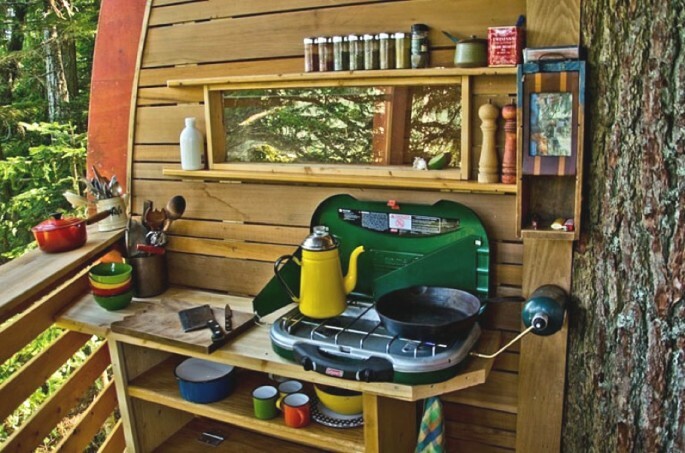 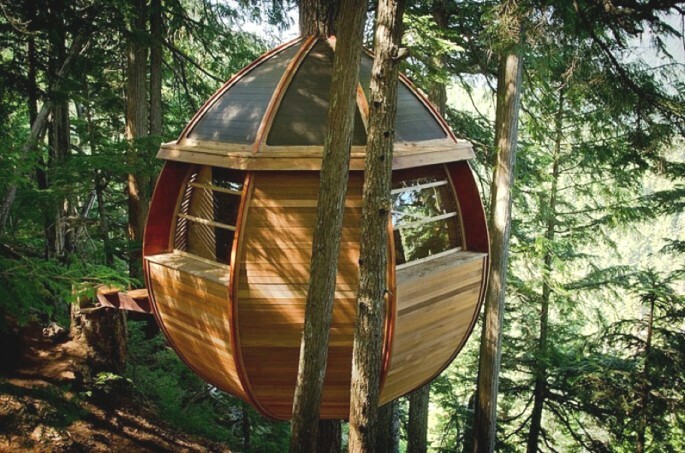 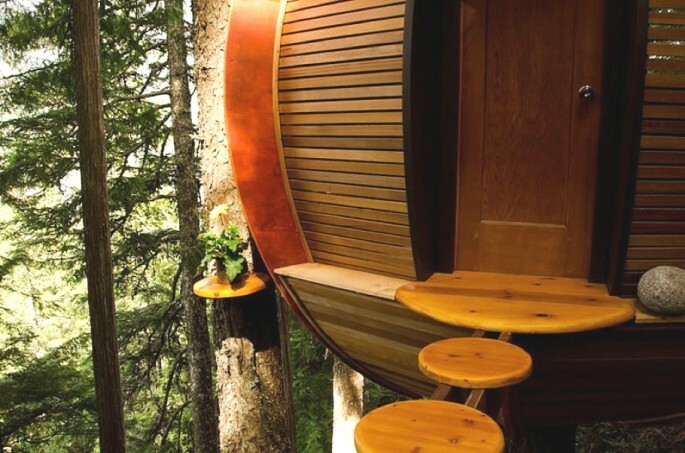 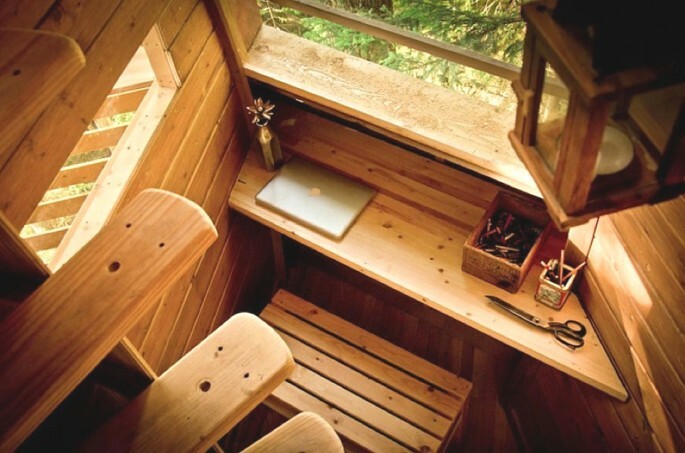 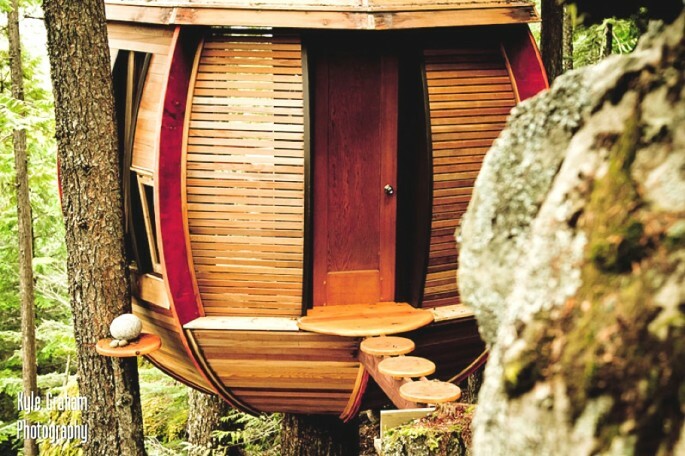 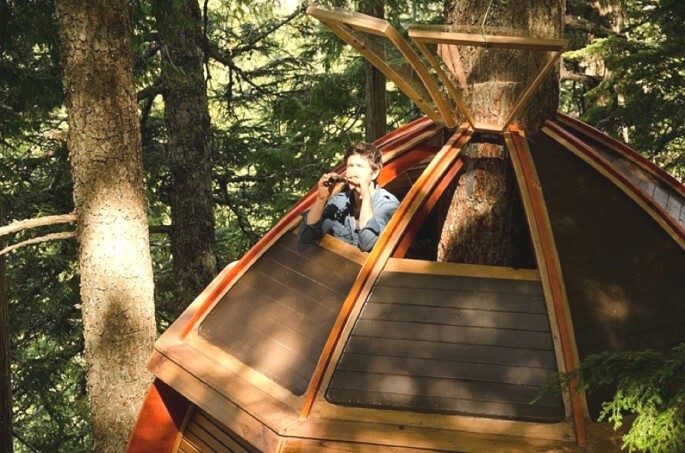 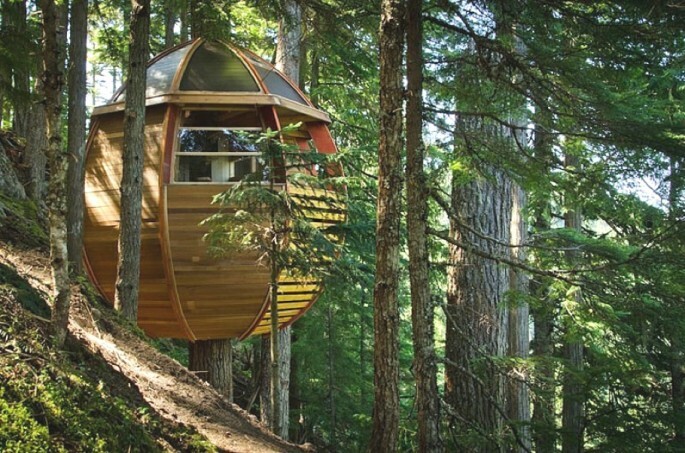 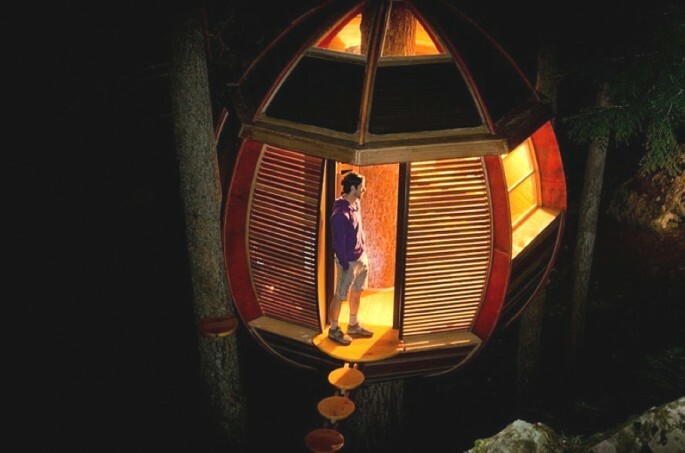 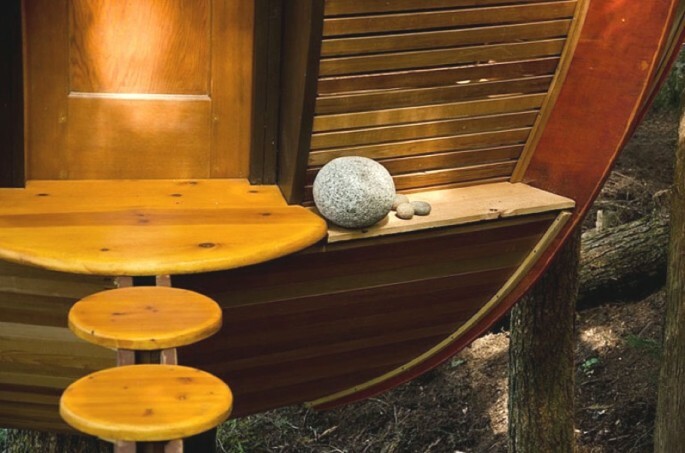 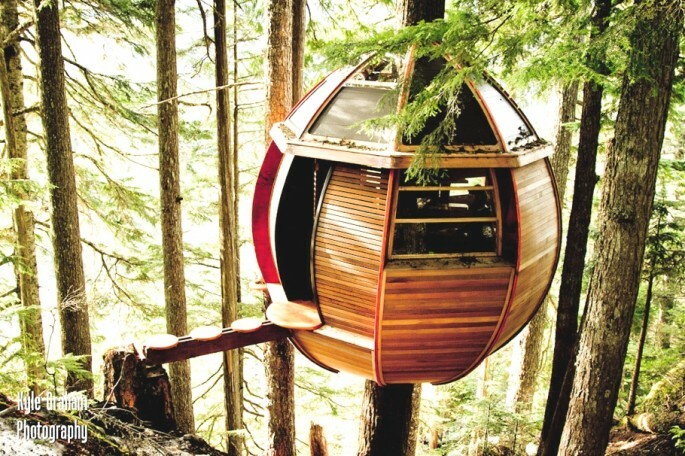 Former IT technician and carpenter, Joel Allen, built the HemLoft, a pod sized treehouse. 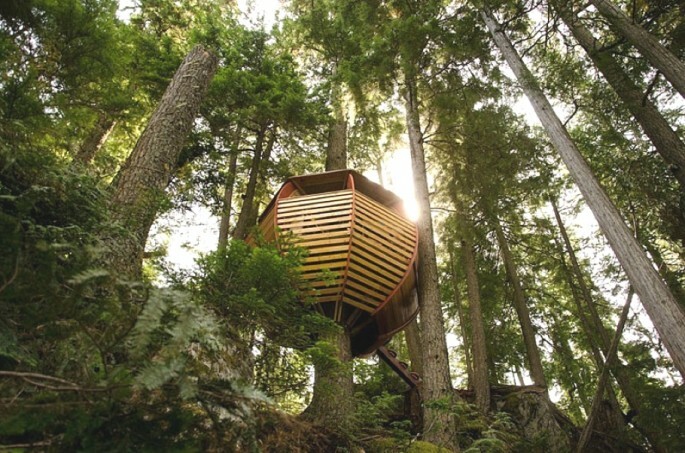 The contemporary structure can be found in British Columbia, Canada. 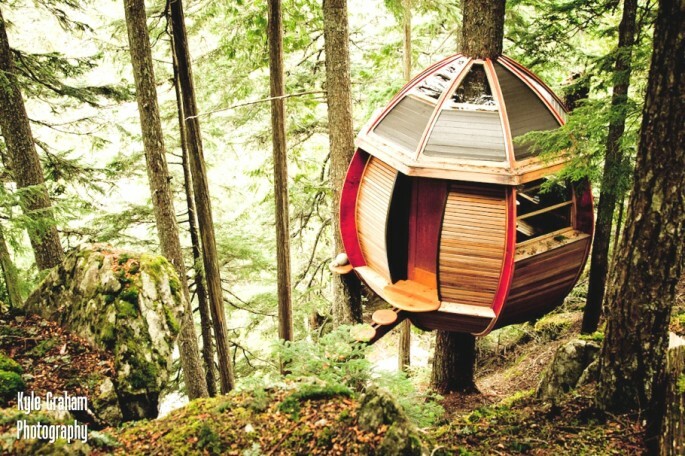 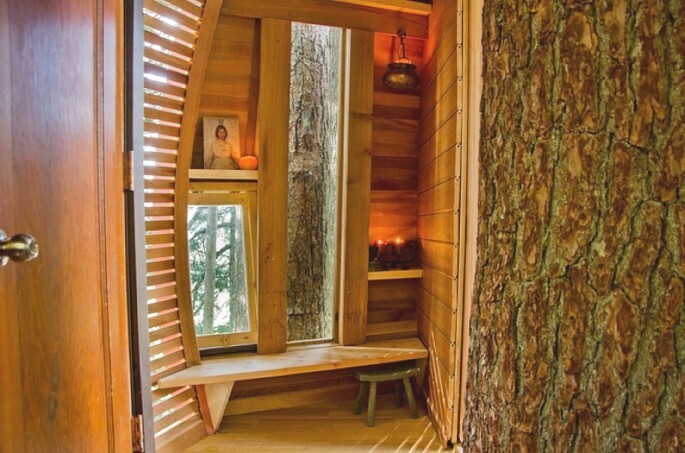 The contemporary Canadian treehouse is a secret self-funded creation. 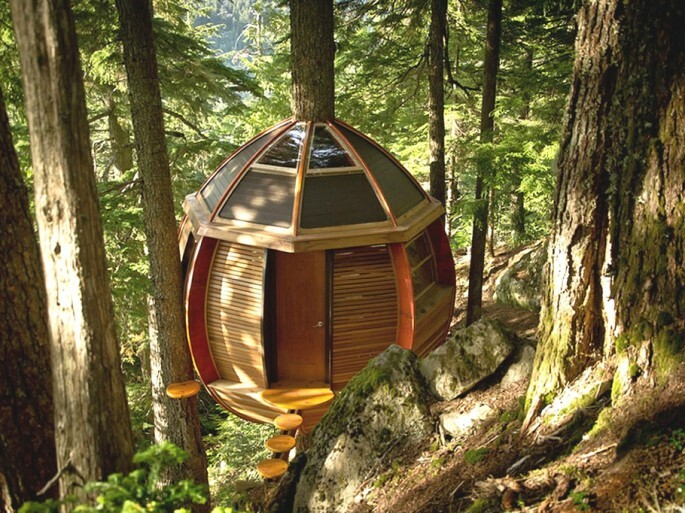 It hangs on a precipitous slope, in a towering stand of hemlocks, about a five minute walk from the nearest road. 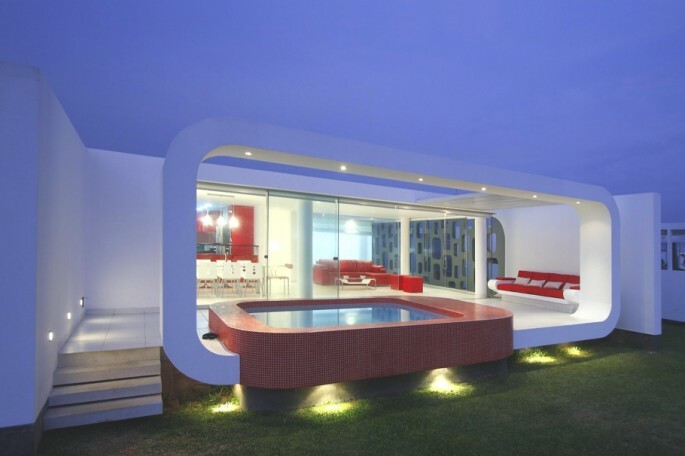 Metropolis a Lima-based design studio has designed the House in Palabritas Beach. 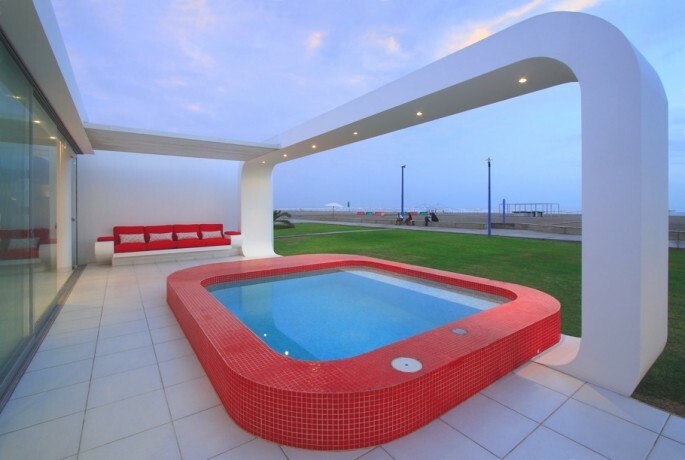 Completed in 2009, the contemporary property is located in the Palabritas Beach, Lima, Peru. 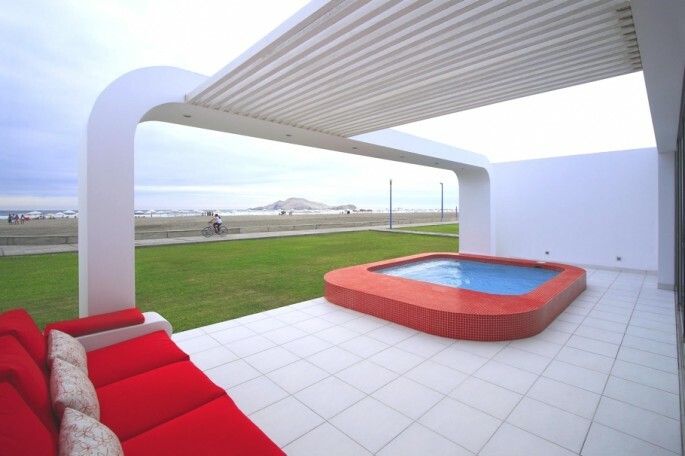 According to the architects: “The contemporary Peruvian property is located on the first row of lots and was designed so that the architecture acted like a frame to the view of the beach and the islands that are found in front of the house. 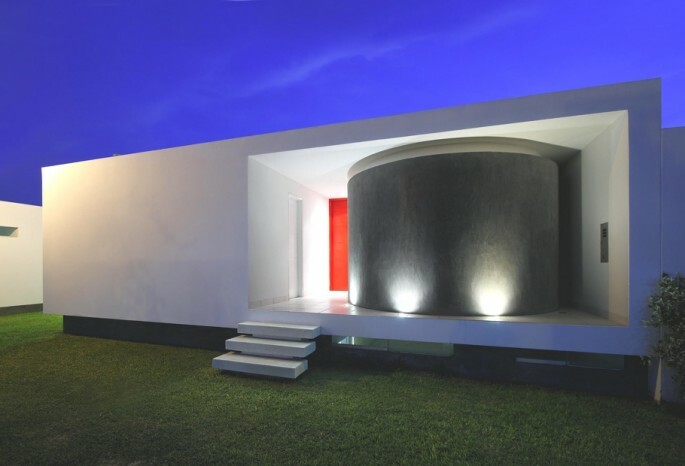 The esthetic of the house celebrates the summer with modern curves that remind us of the Brazilian architecture of the sixties. 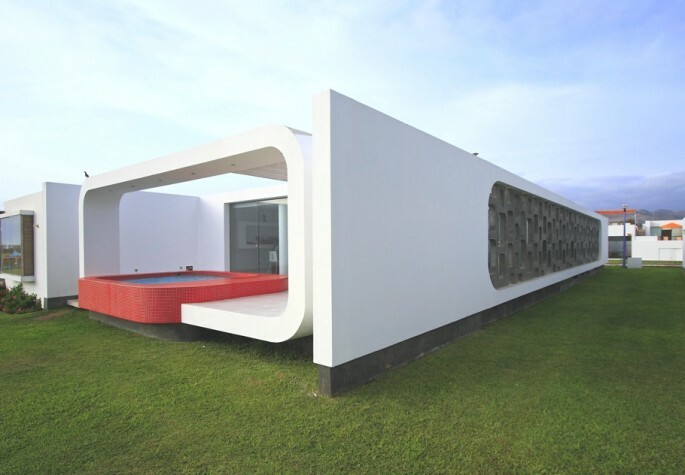 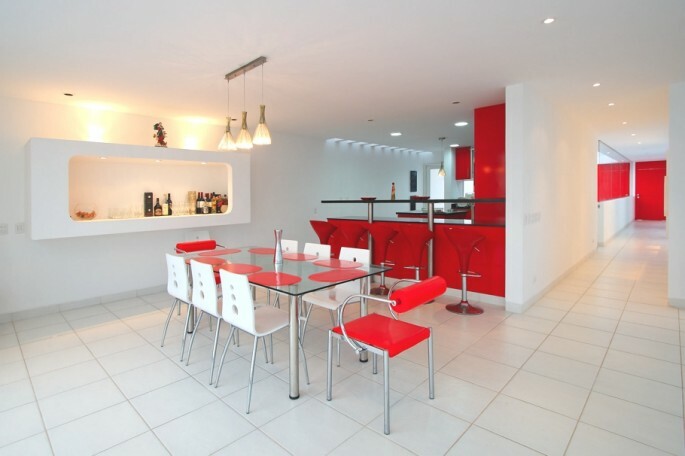 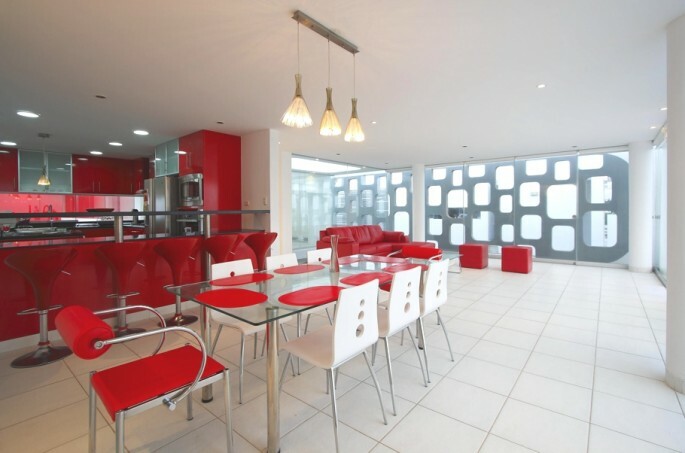 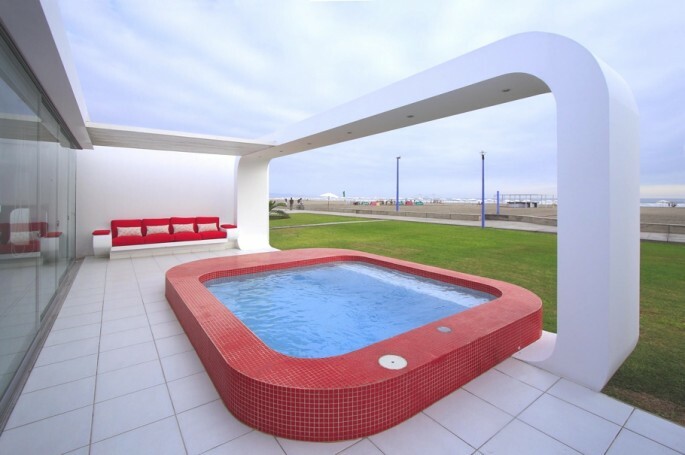 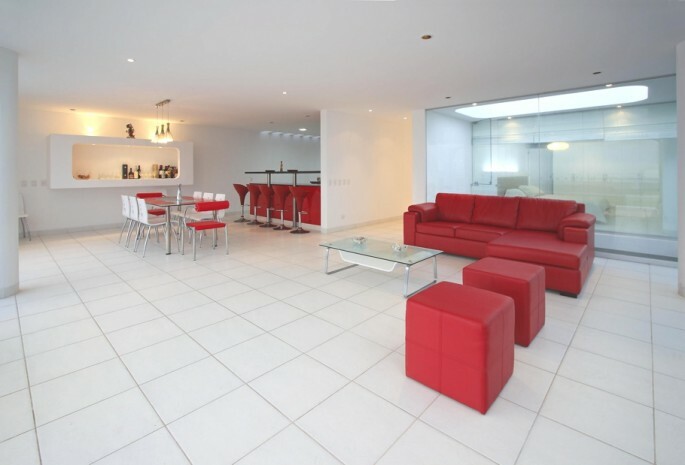 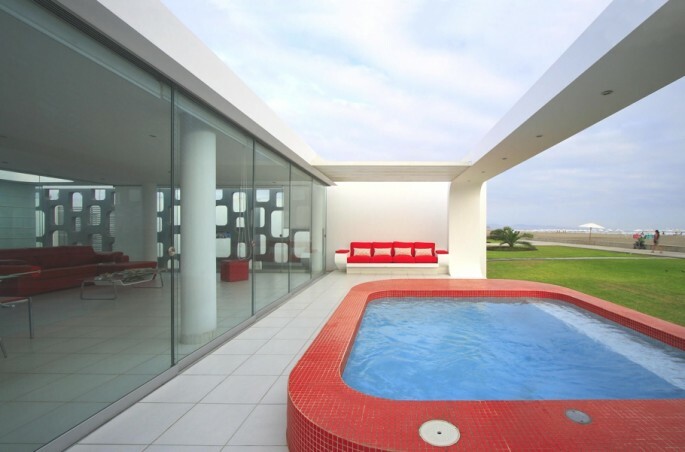 “The contemporary Peruvian house has a white finish with colour accents in red, in both main elements such as the swimming pool as well as furnishings. 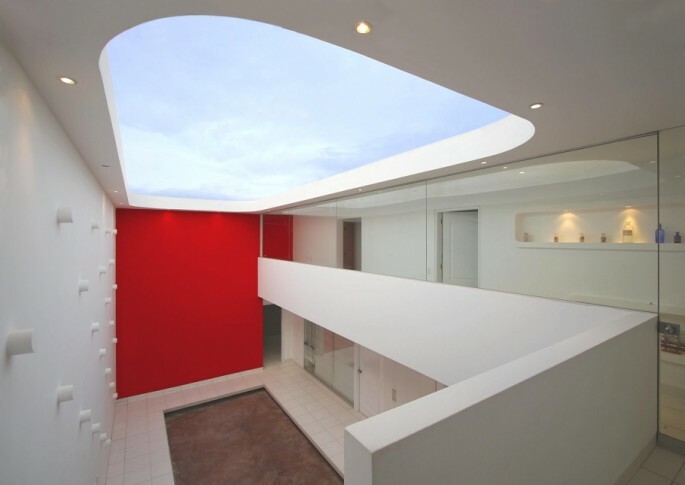 The house reminds us of competitive elements used in Stanley Kubrick films, with the white curved elements contrasted with details in red. 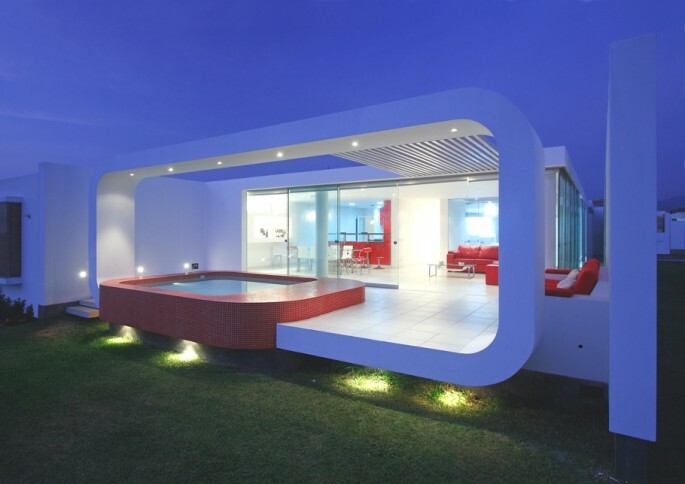 “The exterior was designed as a white elevated box, exposed from its front side. 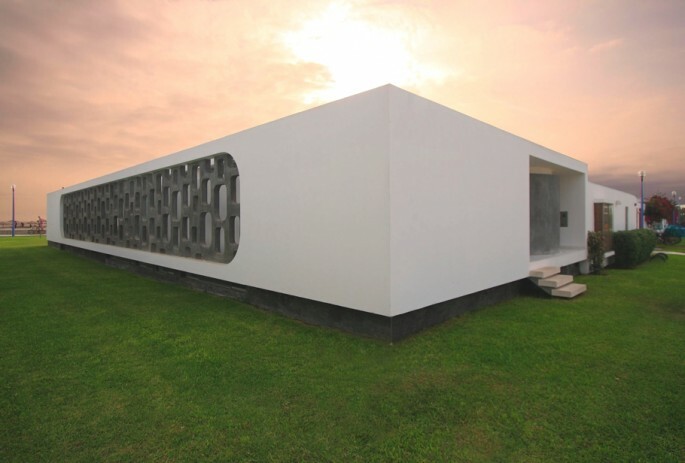 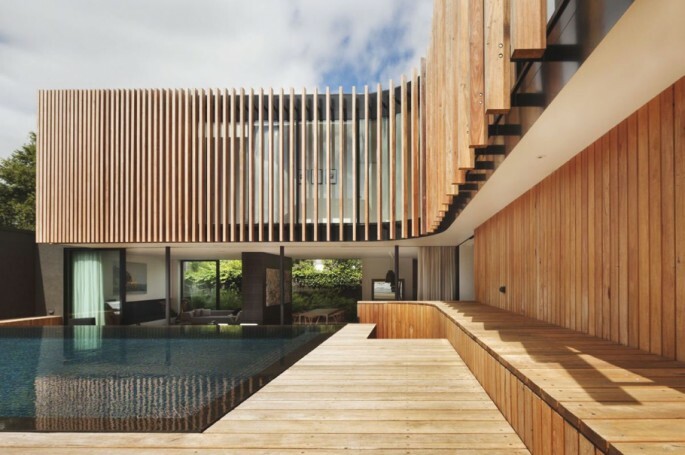 One of the sides has a concrete lattice based on a contemporary composition with perforations that allow the interior to have a transparency without losing its intimacy. 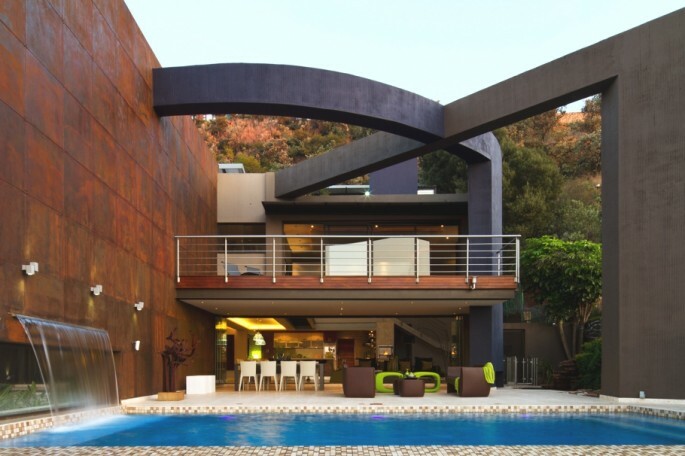 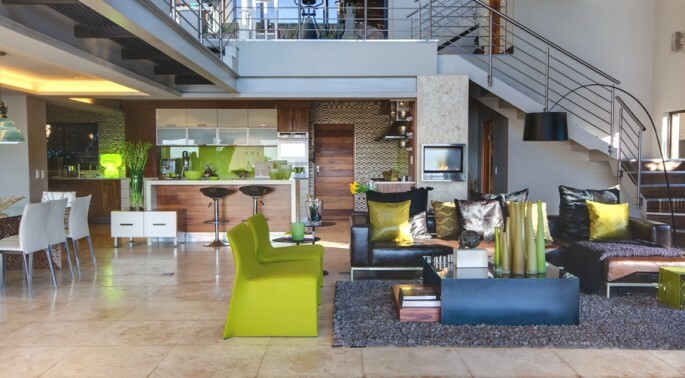 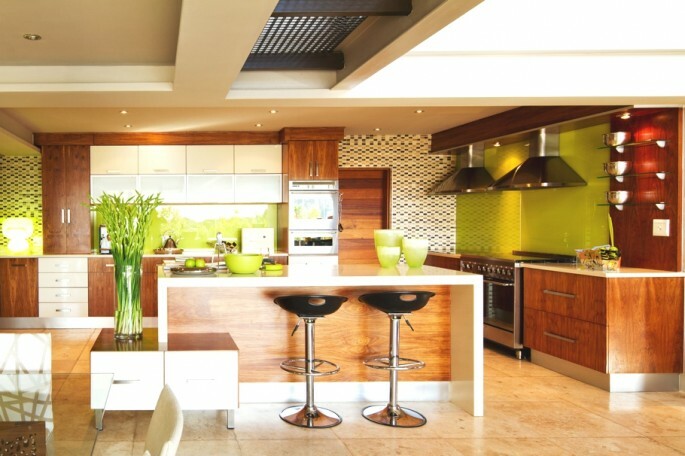 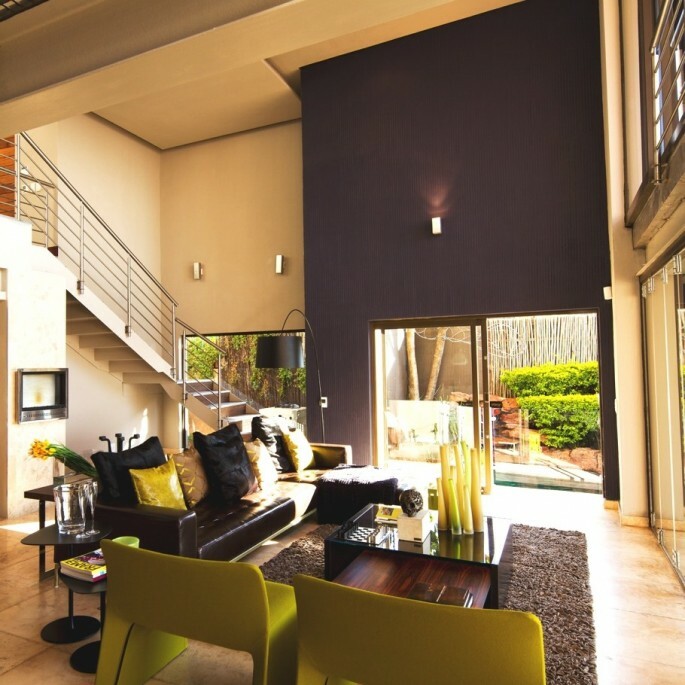 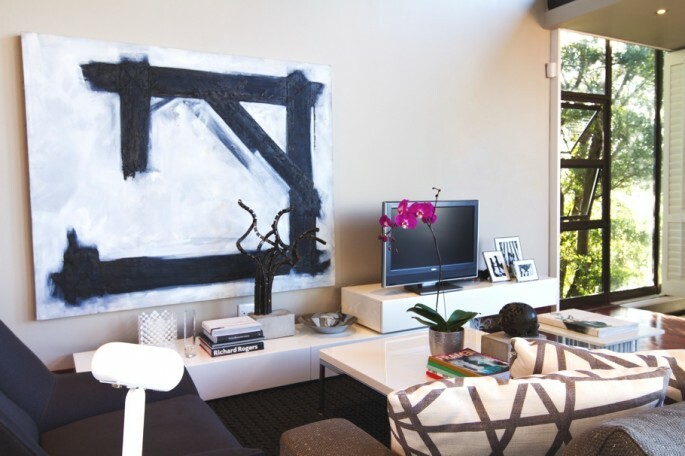 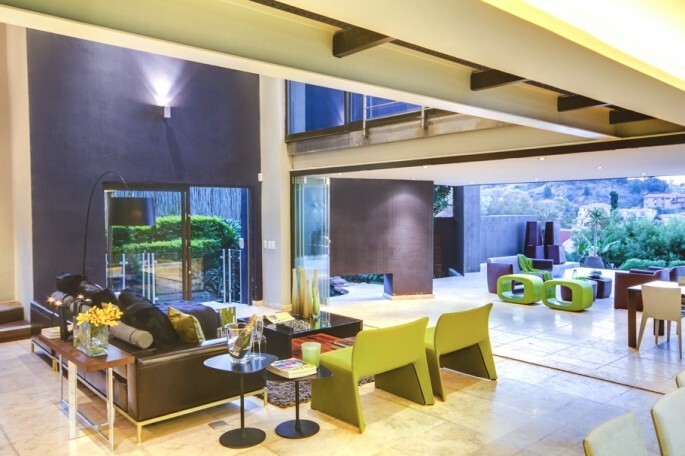 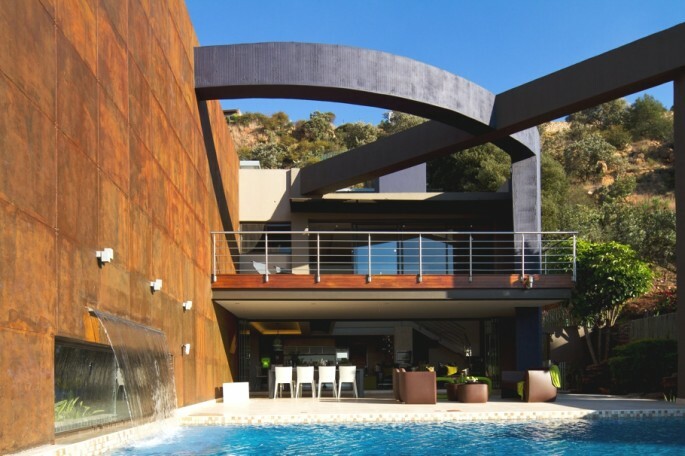 “Sliding the glass doors were used so the dining and living rooms could be integrated as one. 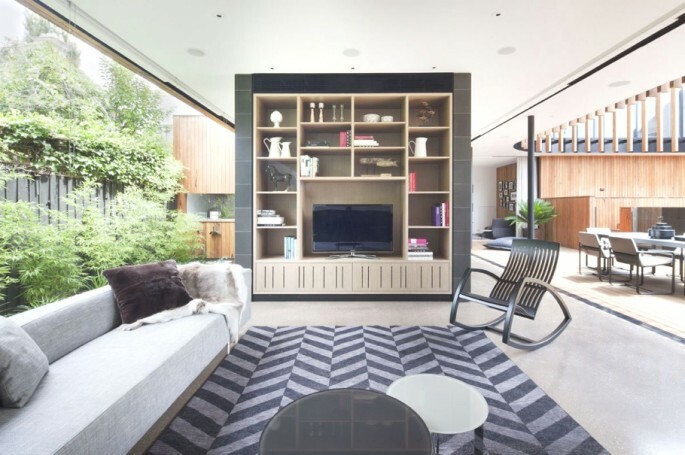 “An interior patio was developed on a lower level where the bedrooms and family room conjoin so that an intimate zone for these rooms are created. 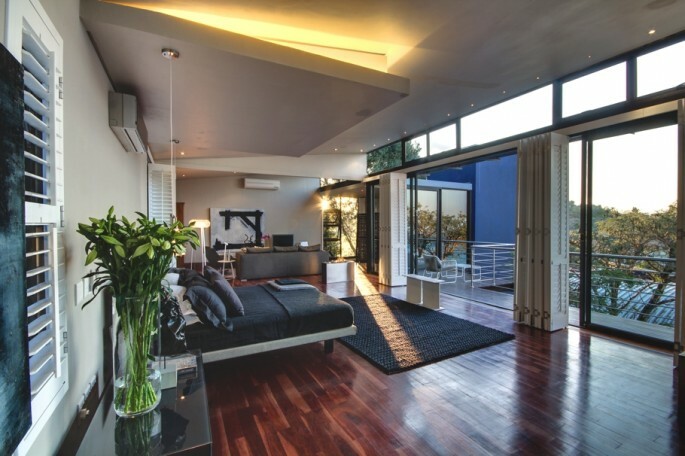 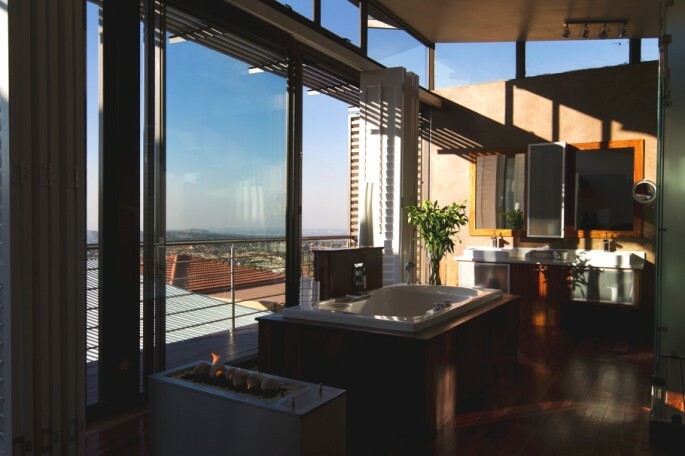 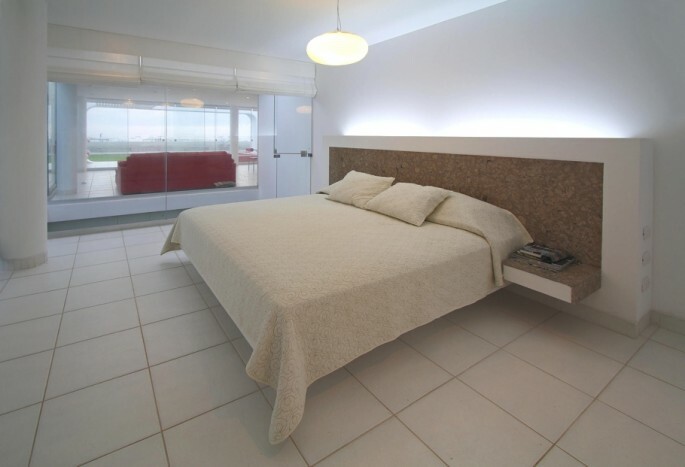 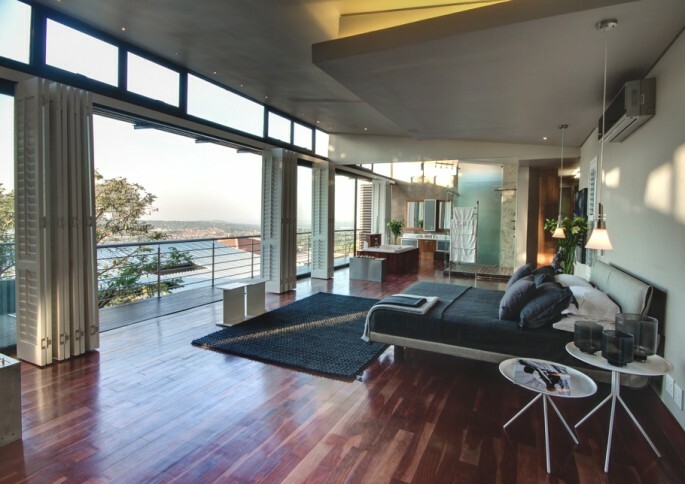 The main bedroom is located on the first level and was designed so that it had a view towards the ocean. 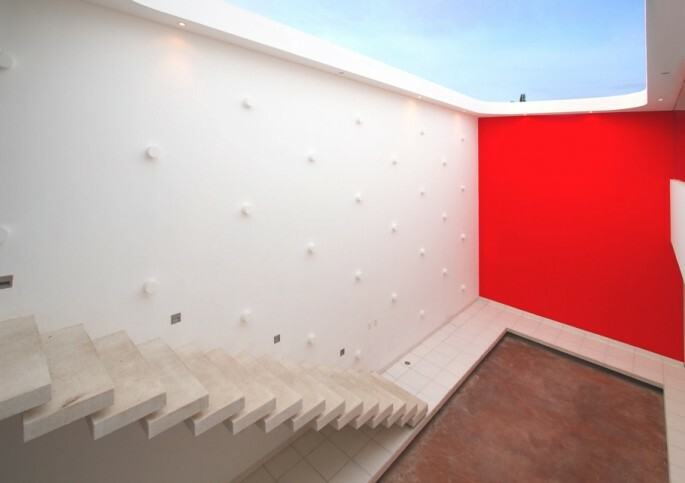 “As a whole the house created a contrast with red colour over white surfaces, in a way that the spaces give an appearance of amplitude. 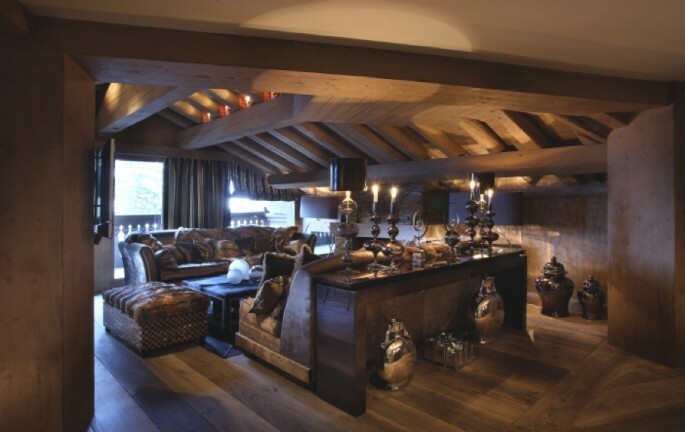 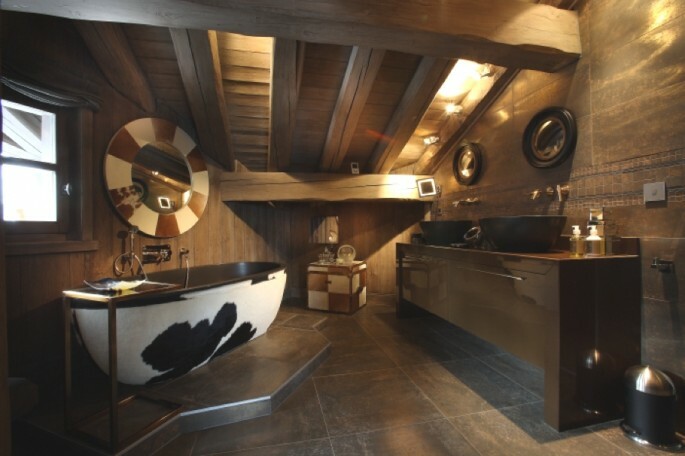 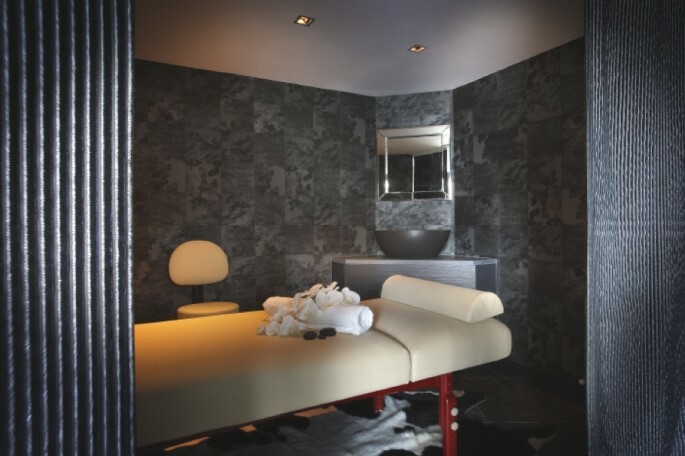 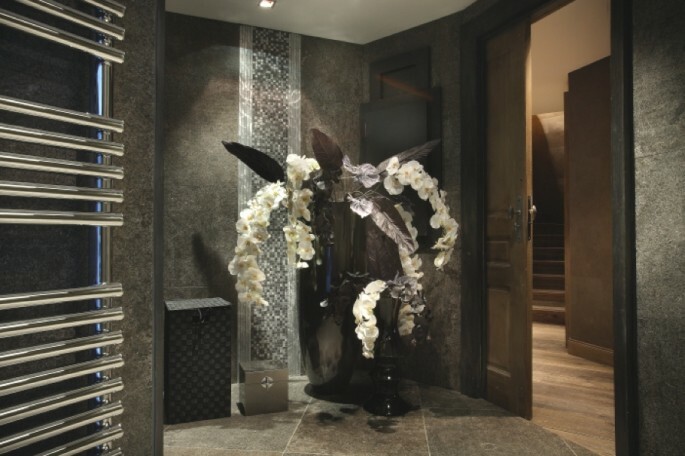 London-based Earlcrown a luxury project management and design house have completed the Courchevel 1850 project. 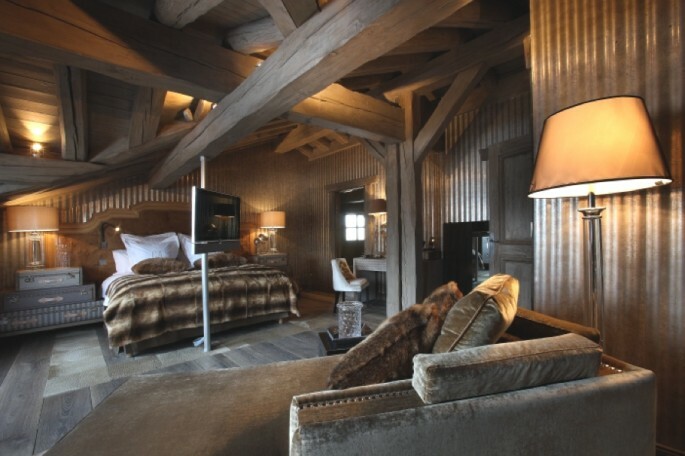 The stunning luxury property can be found in the ski-resort of Courchevel, France. 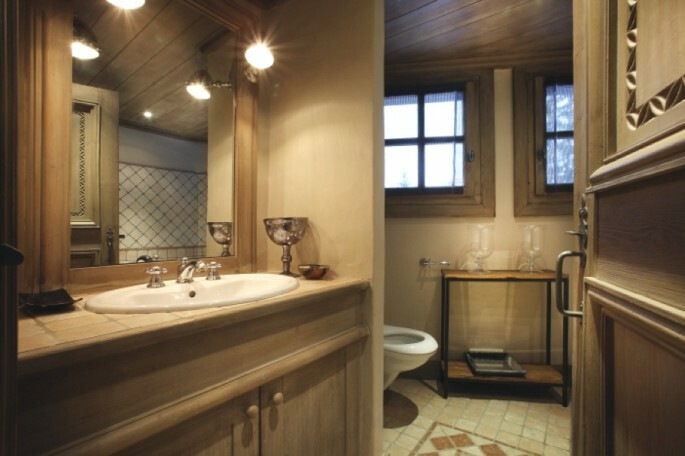 Benefiting from panoramic mountain views, the chalet at Courchevel 1850 is set in landscaped gardens and is accessed via a private drive. 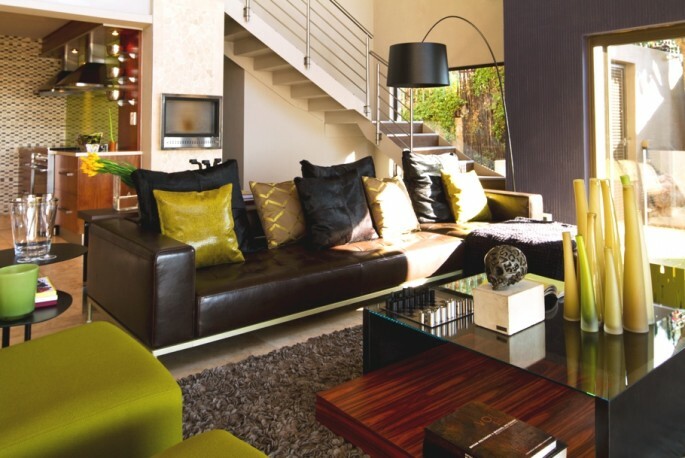 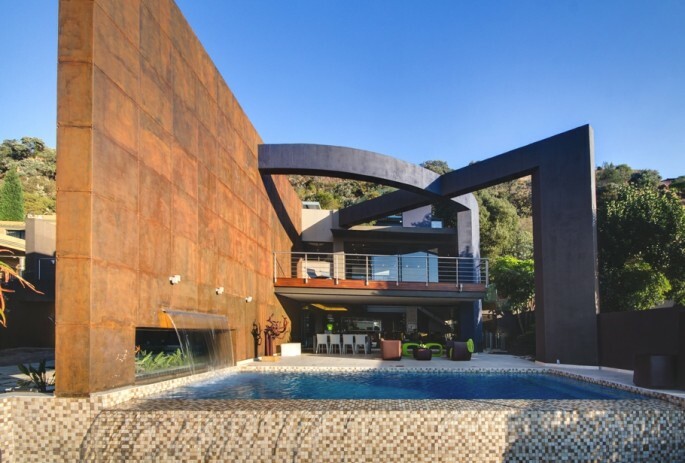 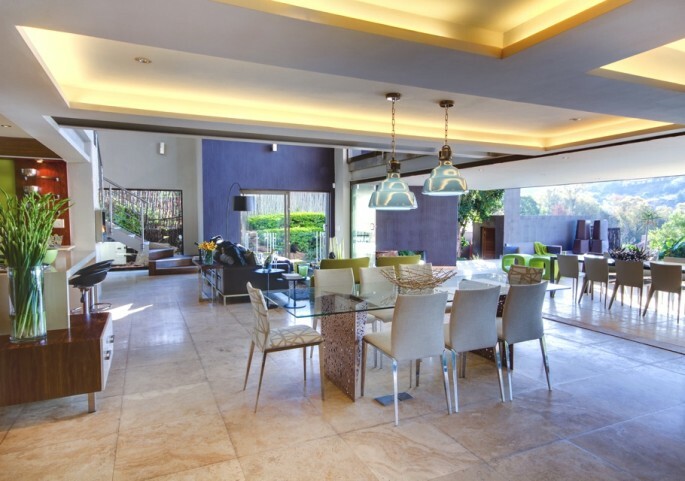 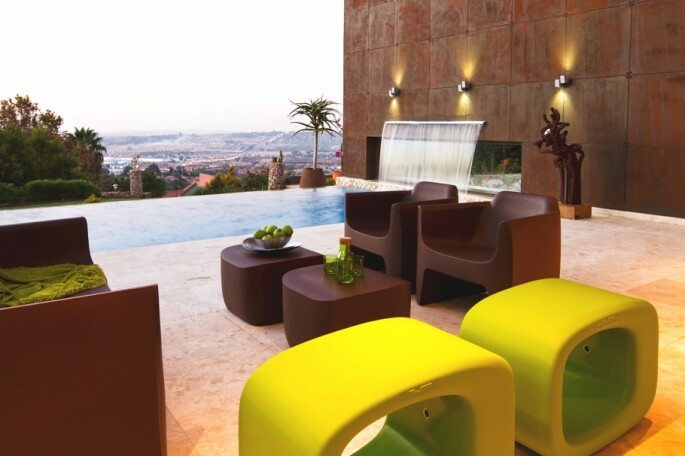 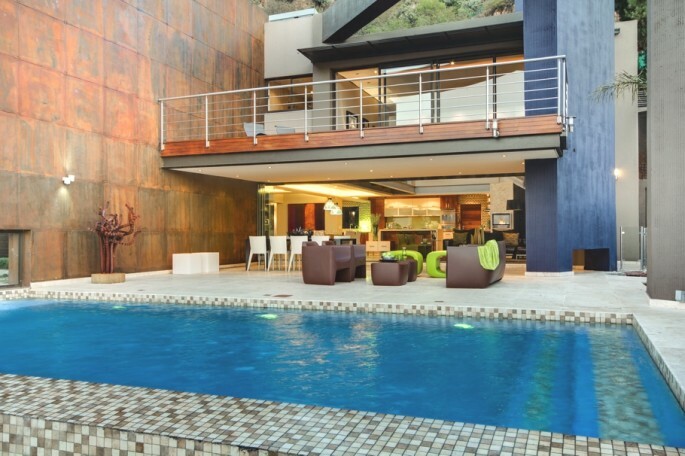 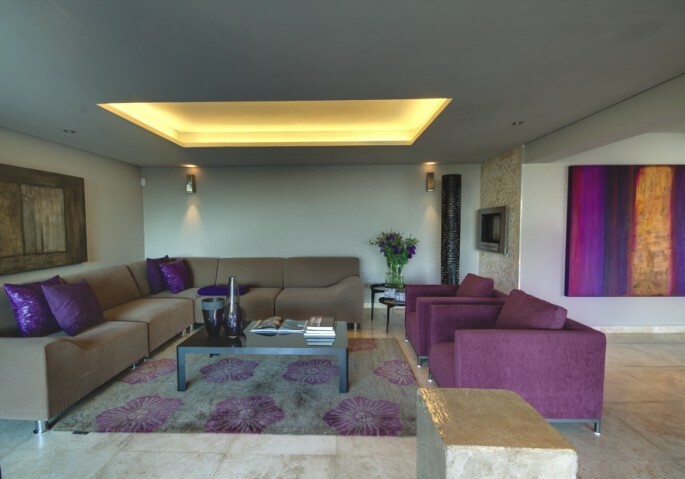 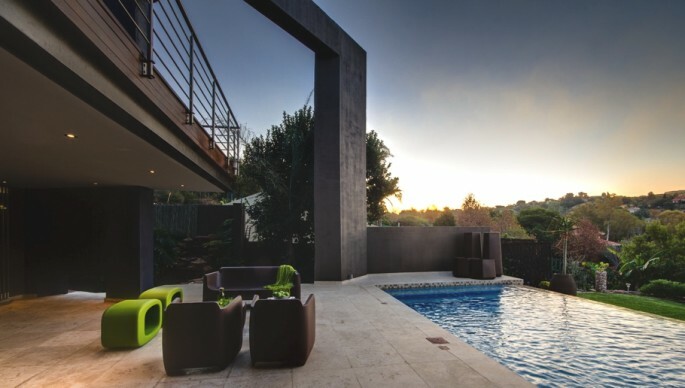 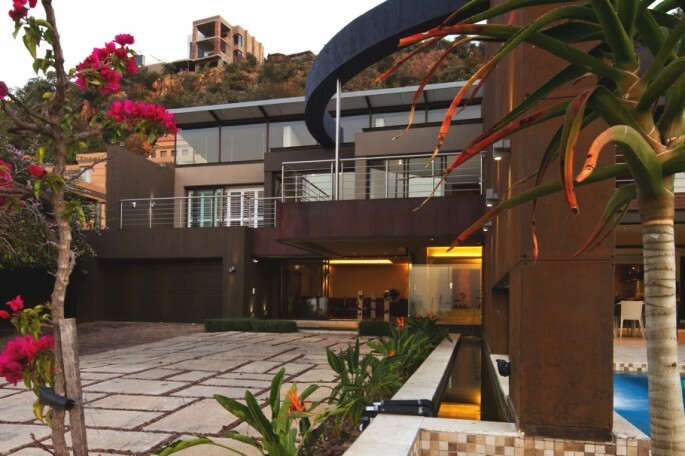 It provides a luxurious living space set over four levels, complete with large outside terraces. 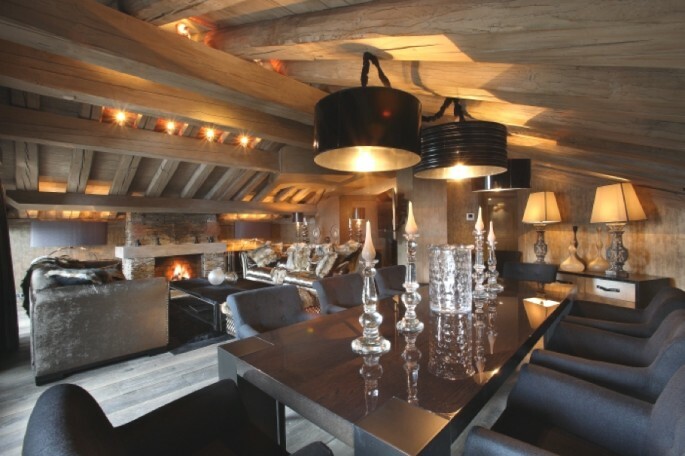 Earlcrown’s vision was to create a chalet whose quality and style would set a new level of luxury for Courchevel residential property, which is already of a world-class standard. 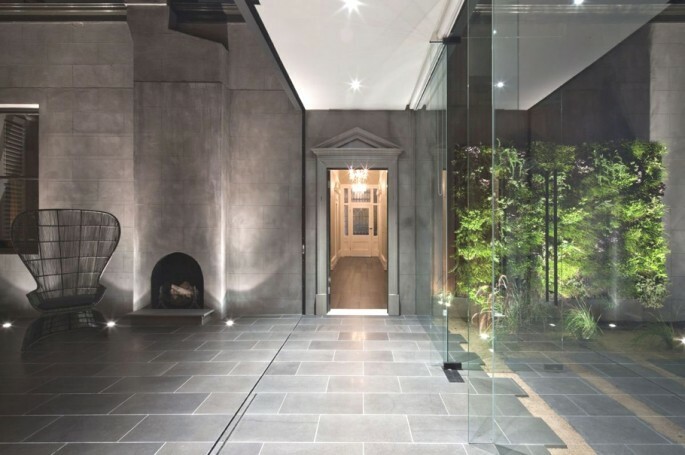 Earlcrown extended and remodelled the large existing luxury French chalet by over 2,153 sqft (200 sqm) to transform it into a true super-prime residence, using the finest stone and timber built in traditional style. 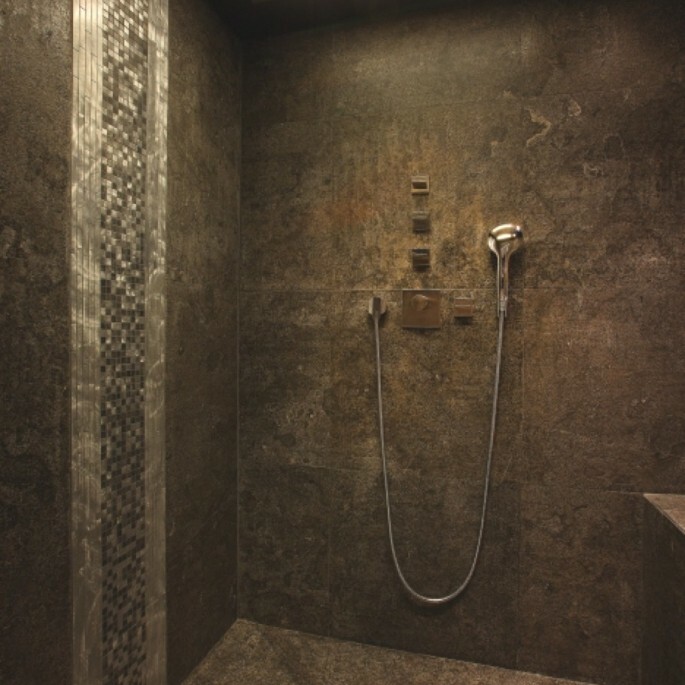 The Internal architecture was completely reconfigured to include luxury leisure facilities such as an after dinner open bar, private cinema, gymnasium and fitness suite, sauna, massage area and hammam. 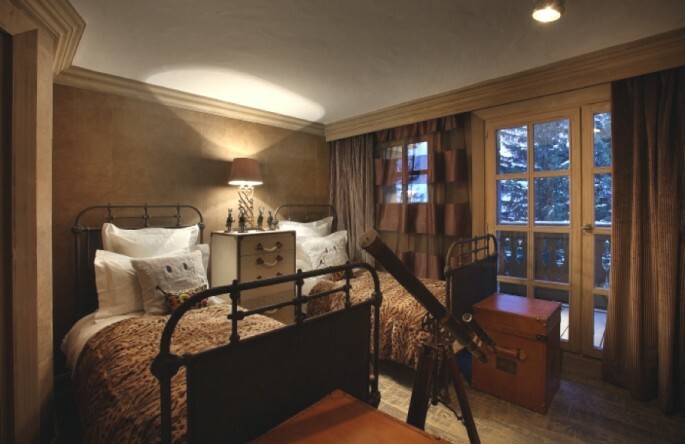 The luxury French property also boasts landscaped gardens, heated outdoor terraces and a spectacular outside leisure deck with sunken Jacuzzi provides sweeping mountain views. 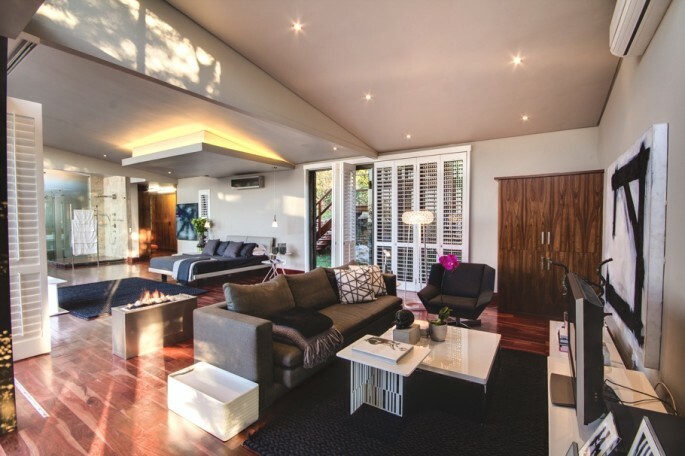 The large main living room with open feature log fireplace, wood beamed ceiling and French doors opening onto a spacious outside terrace. 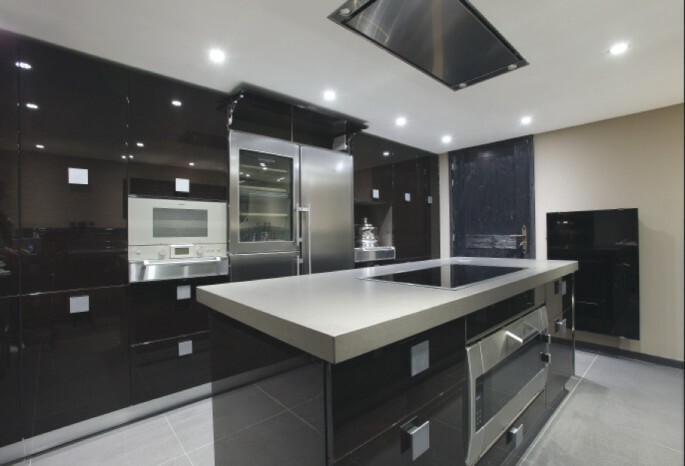 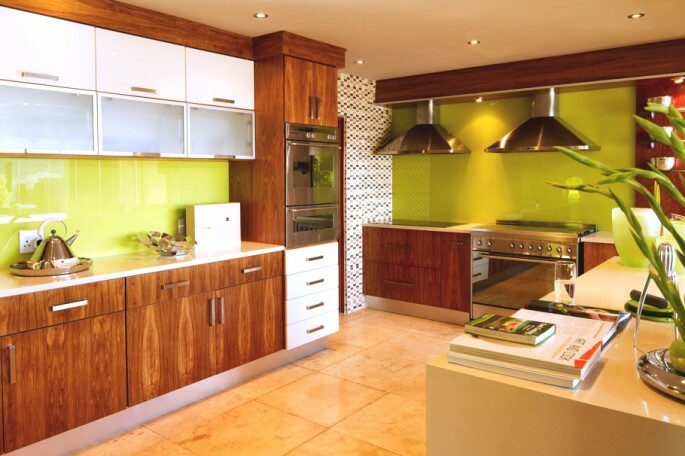 Earlcrown also introduced a lift to connect each floor, under floor heating, new security systems and CC TV security – plus a new commercial caterer’s kitchen to facilitate grand entertaining. 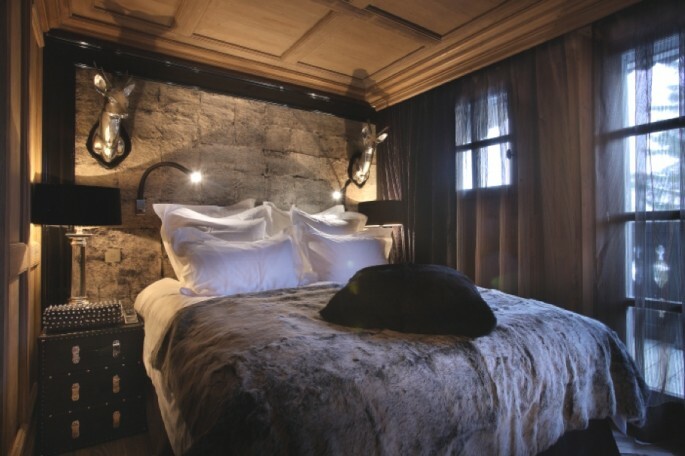 The interior architecture and interior design created by EarlCrown working in conjunction with leading French interior designer Noelle Bonnemaison, who designed the interiors of the Saint Roche Hotel in Courchevel and La Tartane in St Tropez. 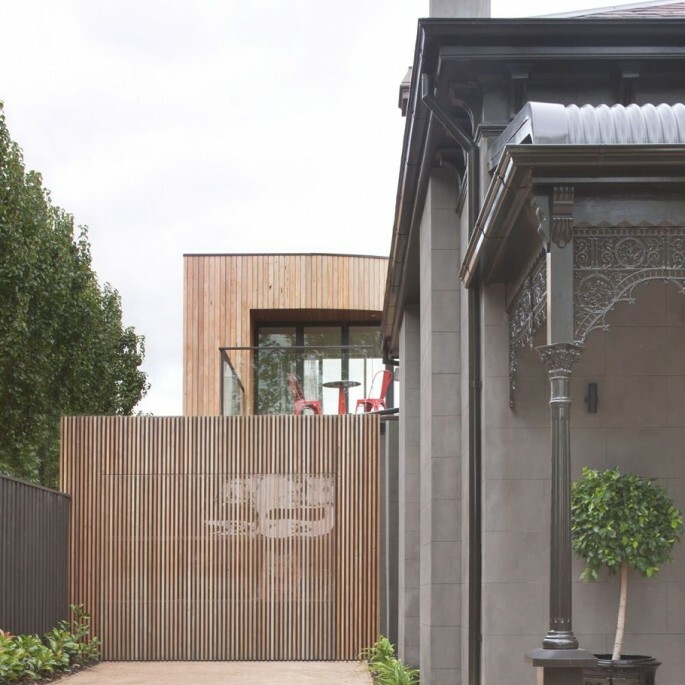 “The existing site contained a grand Victorian double front dwelling badly in need of repair. 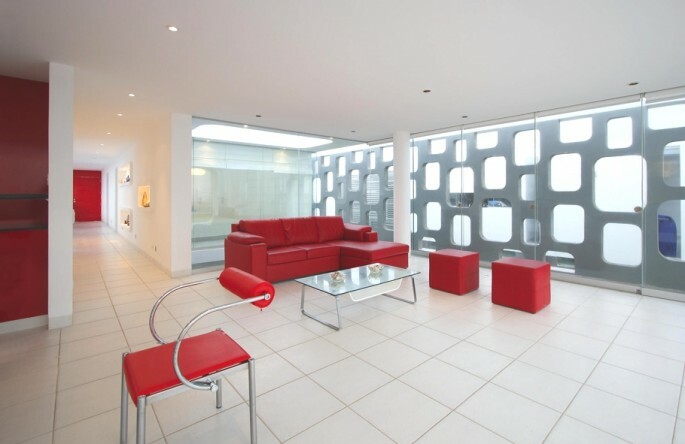 Upon persuasive encouragement and expert advice the client agreed to retain the front elements of the building. 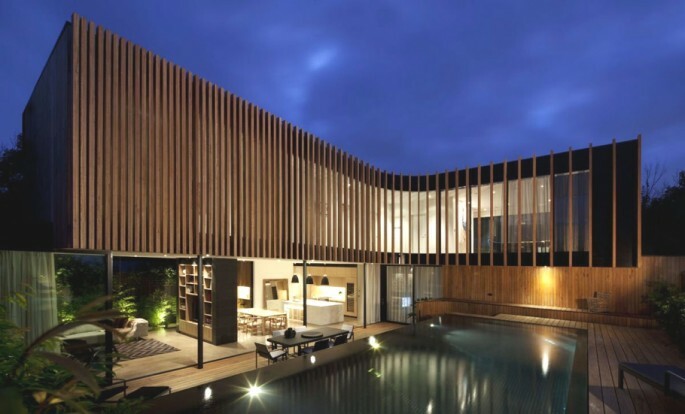 “Following the removal of a previous addition, the extensive brief requested an upper level addition, garage and pool. 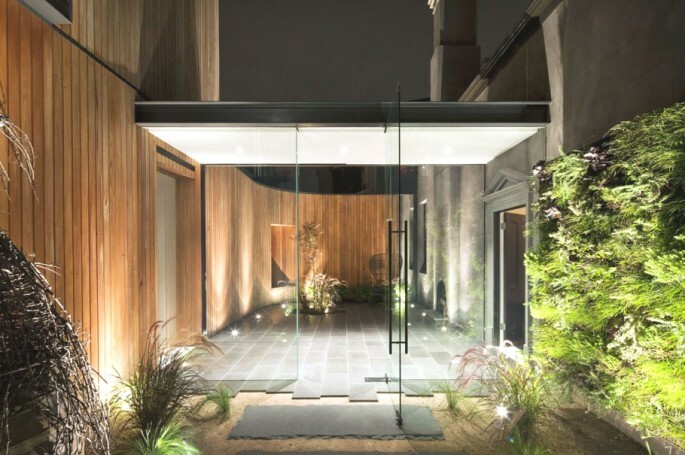 Our choice (given depth of the site) was to separate rather than attach the new works to the rear of the existing building which availed textured areas of external space between old and new objects. 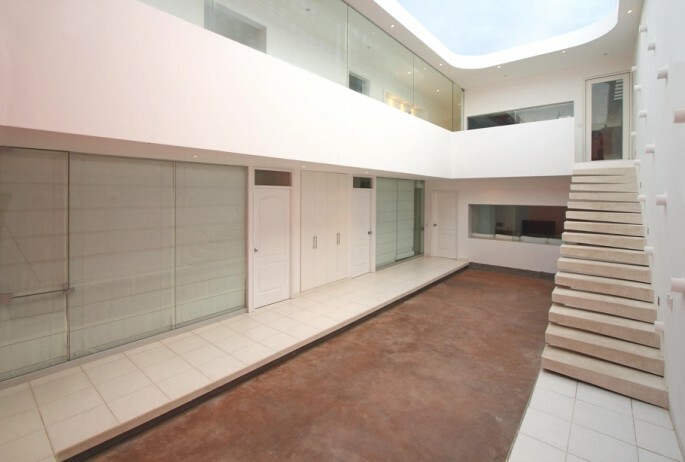 Two levels of new ‘L’ shaped floor area are stacked on top of each other at the rear utilising the limits of the site. 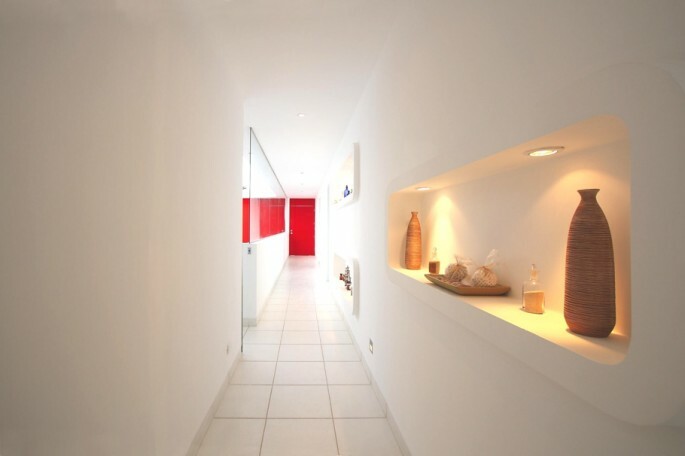 “Ground level links are made via a Garage and a circulation ‘bridge’ extending off the existing hallway. 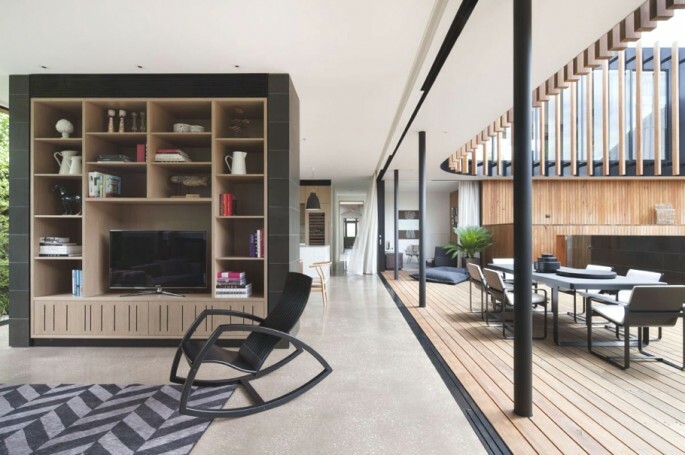 This hallway continues as a main axis through new and old to the rear of the contemporary Australian property. 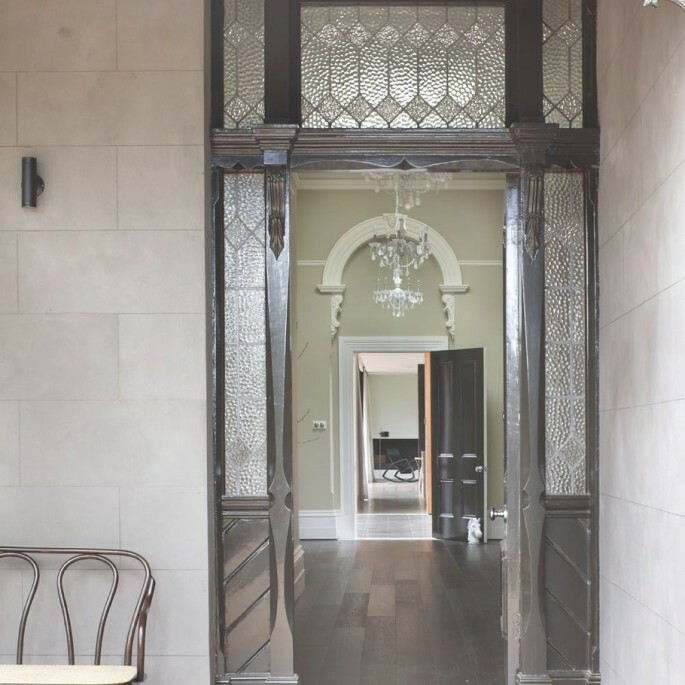 Presented as a corridor of archways this ‘journey of time’ sets up a series of delayed thresholds or framed scenes. 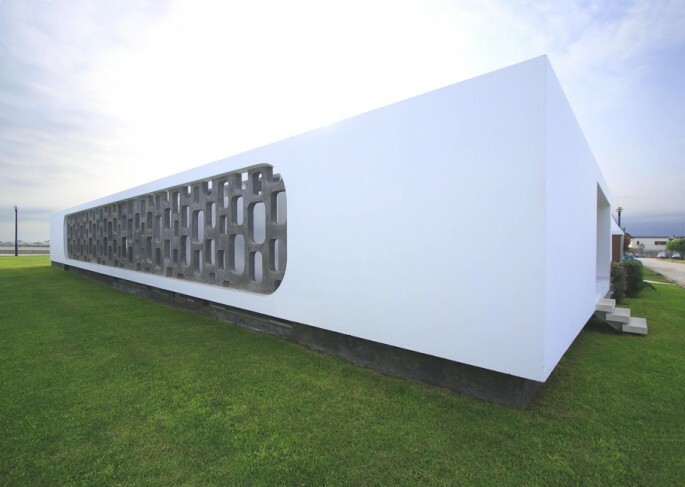 Although the new work is deliberately set apart as new ‘pavilion’, it is deliberately recessive from the street adding to the sense and cognitive interest once one reaches the end of the axis leaving little memory of the original Victorian dwelling. 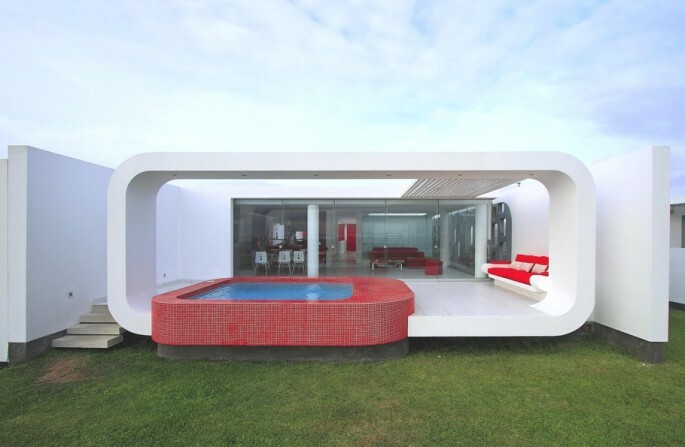 “The interior spatial logic of the original was flipped. 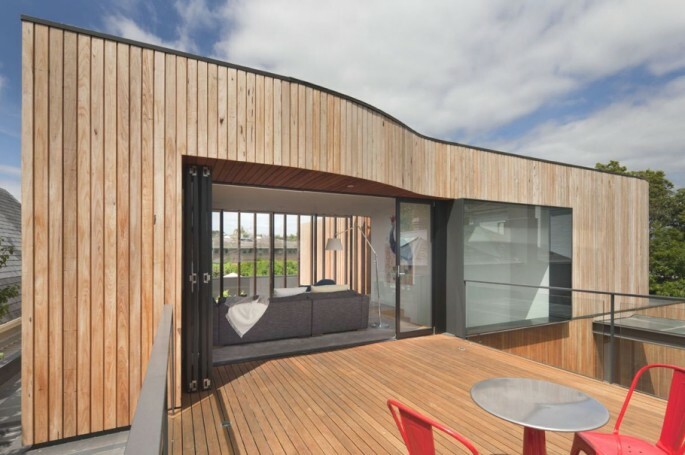 The formality of the existing dwelling was deliberately used for adult (sleeping and greeting )uses whilst the rear of the ground level converts to more informal Living purposes with Children’s facilities upstairs. 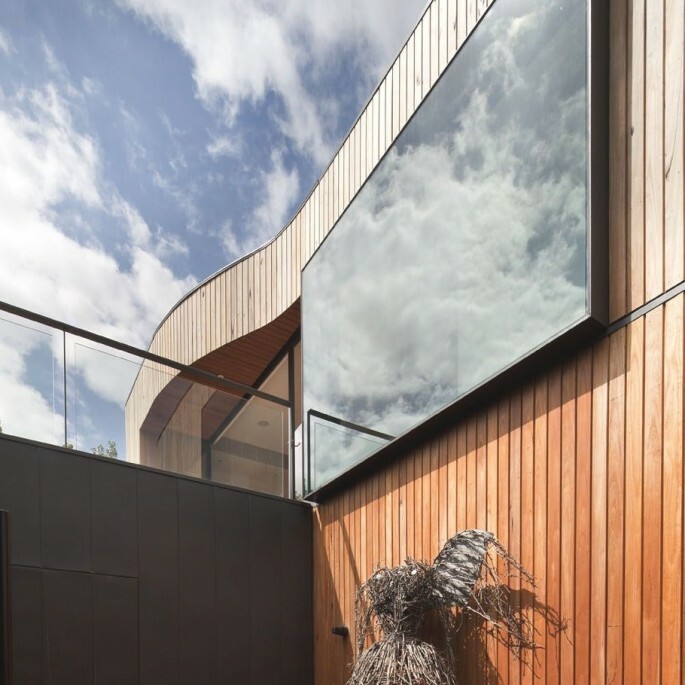 Small extensions off the ground floor ‘L’ and nips and tucks to the first floor enable a series of separate individual & private light courts that spill off the internal spaces. 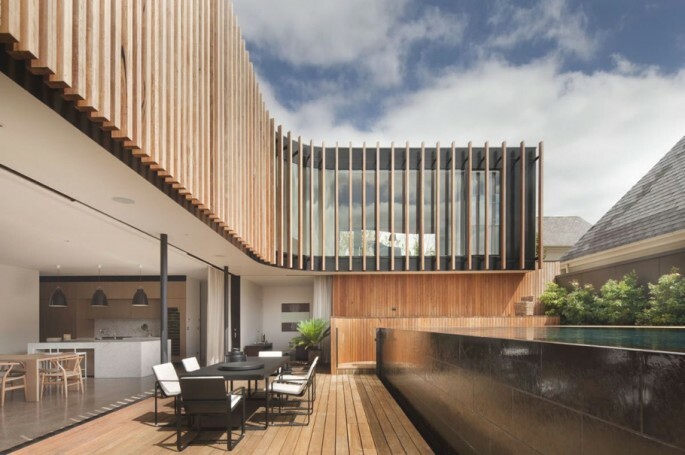 “The warmth and sensuous use of the timber cladding and the employment of radii/curved corners within the apexes of the stacked ‘L’s also help to enhance a more sculptured and playful point of difference to the rigidity and masculinity of the existing contemporary Australian building. 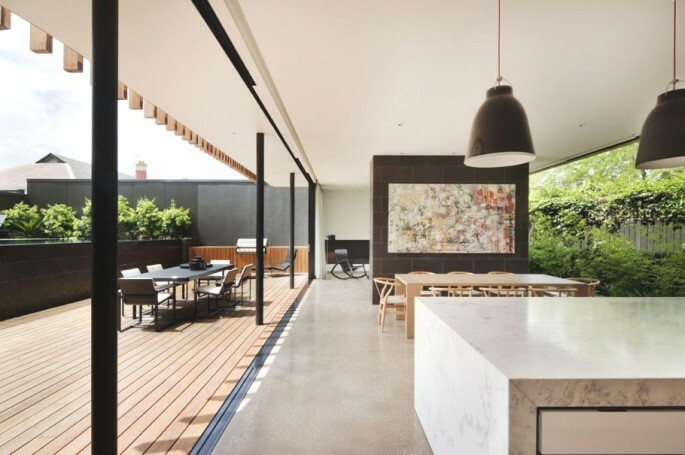 The central courtyard area could have presented as the rear faces of the front and rear buildings however these spaces perhaps instead provide the most interestingly spatial experience & reading of the history of the site. 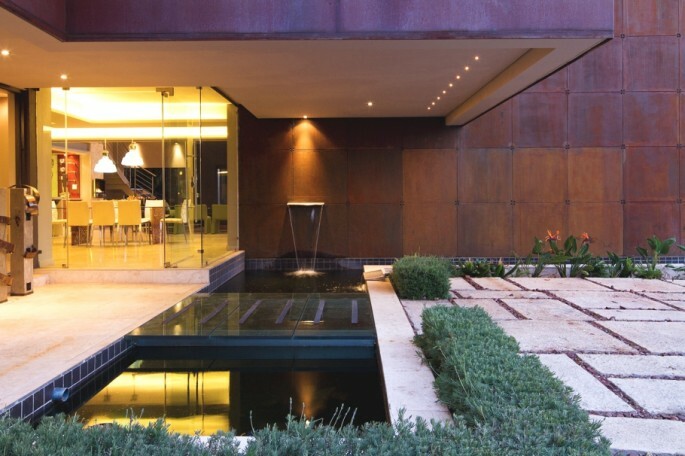 A glass prism openable to the elements links in a metaphorical bridge between old and new and provides an important temperature regulator. 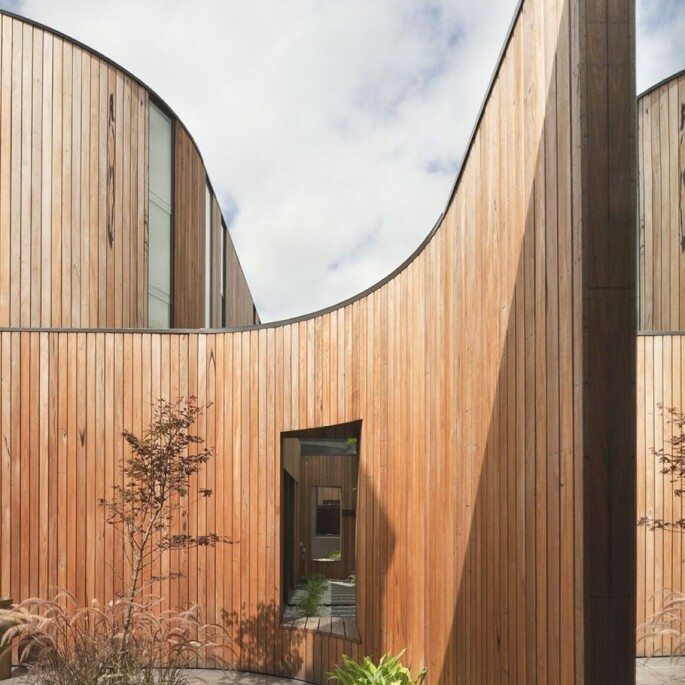 The ‘stacked’ floors of the timber façade wall combine and separate in opposite directions in a ‘paper tearing’ action accentuating the more sinuous and organic drama of the rear building. 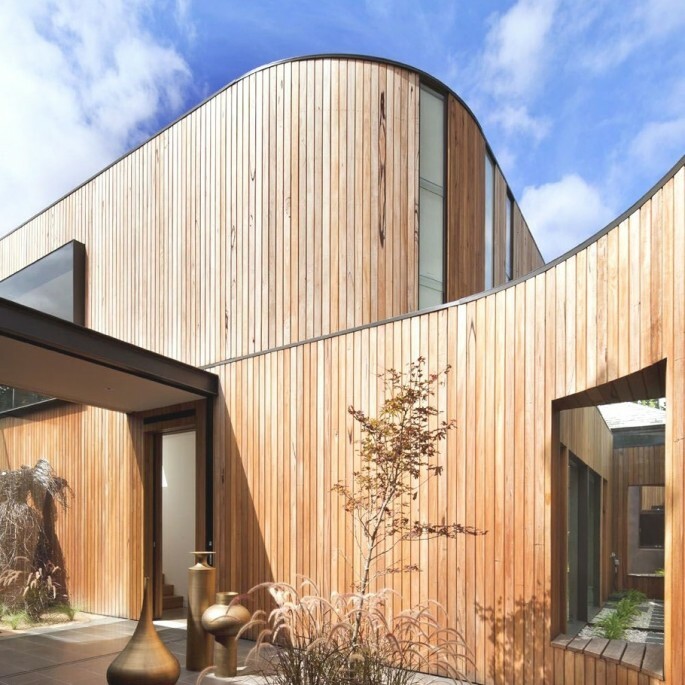 “At the rear 70 solid blackbutt timber fins functionally address overlooking and solar emission concerns as they disperse gradually from east to north & break down a seemingly solid façade at one end to be completely permeable at the other. 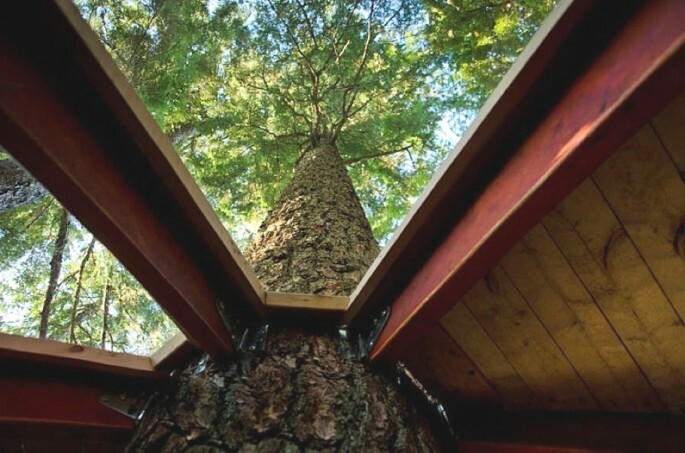 In contradiction the floor beneath act in the opposite way setting up dichotomies of weightlessness and groundless.